Start early. The American Dental Association recommends children visit the dentist within six months of their first tooth or by age 1.9 Early visits give kids a chance to become familiar with the dentist and may help reduce anxiety down the road. Lead by example.10 If you’re nervous about the dentist, your kids might pick up on it and adopt the same attitude. According to a study in the International Journal of Pediatric Dentistry, adults can transfer their dental fears to family members. Make a conscientious effort to demonstrate a positive attitude toward the dentist while articulating the value of regular visits. By modelling relaxed behavior, you can let your kids know there’s nothing to be afraid of. Take baby steps.10 Stop by the dental office beforehand so your kids learn what to expect in a lower-pressure situation. 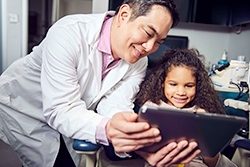 Introducing them to the dentist and staff without the stakes of an actual appointment can help them feel more comfortable in the environment. Practice beforehand.10 Create a mock dental visit in your own home to remove any confusion they have about what happens in the dental chair. Pretend to clean your child’s teeth while explaining how visiting the dentist helps keep their smiles in tip-top shape. Use relaxation techniques.11 If you’ve tried everything and your kids still get the heebie-jeebies in the dental chair, don’t fear! Try calming them down with some simple relaxation exercises. Instruct your child to inhale and exhale slowly and steadily. You can also try a technique where they tense different muscle groups as tight as can be, then release.